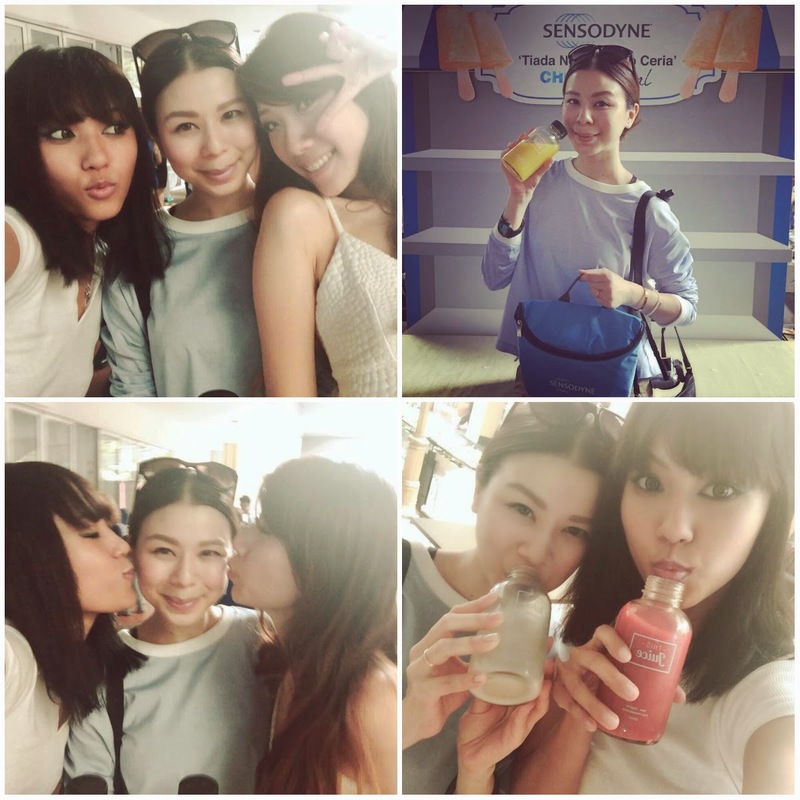 Guess who was the one who introduced me to the brand Sensodyne? It was many years ago and I remembered the scene vividly. I was in the toilet brushing my teeth and I had this tingling feeling and I was asking my dad for a solution while walking to his room, brushing my teeth. He then said to me : Use Sensodyne for sensitive teeth, Mich! He told me a pharmacist introduced to him because he has sensitive teeth as well. That is how I knew of the brand Sensodyne. For those who doesnt know or isn't aware, Sensodyne is a toothpaste brand recommended by dentist to relieve sensitive teeth while offering a range of specifically formulated toothpastes and toothbrushes. Best part, it relieves tooth sensitivity and provides long lasting protection. Sensodyne Fresh Mint, Sensodyne Gentle Whitening and Sensodyne Gum Care toothpastes are amongst the Sensodyne Base range which is formulated to help protect against sensitivity while Sensodyne Repair & Protect with Novamin helps to repair and protect from sensitive teeth. If you want instant relief, try using the Sensodyne Rapid Relied that works in 60 seconds*! Now you can indulge all the delicious food and beverage without any discomfort. 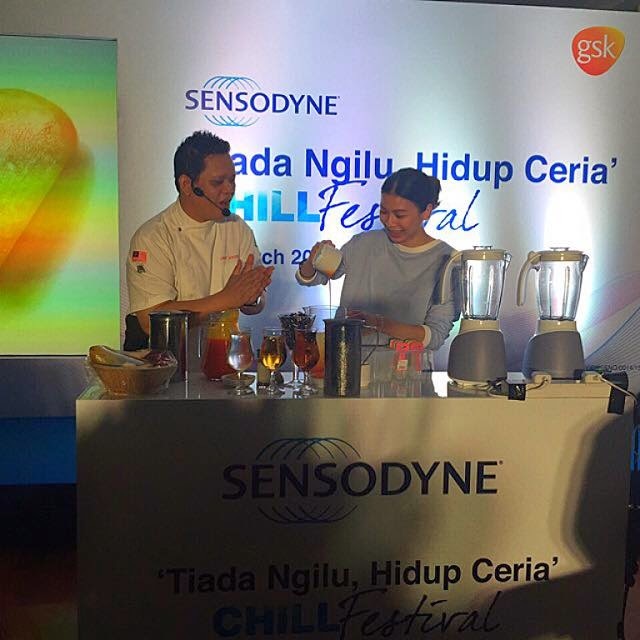 I was lucky enough to be invited for this year Sensodyne ‘Tiada Ngilu, Hidup Ceria’ Chill Festival 2015 campaign. The event kicks off with everyone being invited to enjoy desserts like The Potong Ice Cream, Chatime and also This Juice Co. How nice of them to feed us first with sweet things before starting off the event. After taking photos and having fun at the photo op with fellow blogger Cindy, we were then ushered inside to kickstart the campaign. Doctor Nurul Huda Hassan, Dental Surgeon started the event saying “Sensitive teeth is not only unpleasant, but it can also interfere with your daily life.” Which really hits me. It is true and staying in Malaysia doesnt help it even more as we love our food and drink so much. I cant imagine sacrificing those delicious meals! We were also educated by Mr Wallace Granja, Oral Health Marketing Manager of GSK Consumer Healthcare. Do you know that based on information given by GSK, a report by Oral Care Usage and Attitude study by IPSOS shows that approximately 1 out of 3 consumers of consumers claimed that they have sensitive teeth ? Making tooth sensitivity the highest claimed oral health problem in Malaysia yet only one third of sufferers use sensitive toothpaste to relieve their condition. A survey by Ipsos Brand Health Tracker was held during Sensodyne ‘Tiada Ngilu, Hidup Ceria’ campaign last year that 50% of sensitivity sufferers purchase a sensitive toothpaste after being exposed to the campaign and 50% of Malaysians declared that the top triggers of tooth sensitivity are cold & sweet food or drinks. This campaign proudly reminds them of things that we cared about which include spending time with family and friends & enjoying food and drink without any tooth sensitivity. Then, we all had a pleasant surprise when they announced that a celebrity chef will be preparing some desserts for the guests! It was Chef Andri Hadi and he asked for a volunteer to help him prepared and I raised my hand! Hehe.. he is quite a funny guy and the recipe he prepared was easy to make. I checked mine and it seems that I have sensitive teeth :/ And I admit I am those who have the zingy sensation whenever I eat ice cream haha! Speaking of Chatime, they are also having a contest where you can get 20% off the most voted drink if you participate! 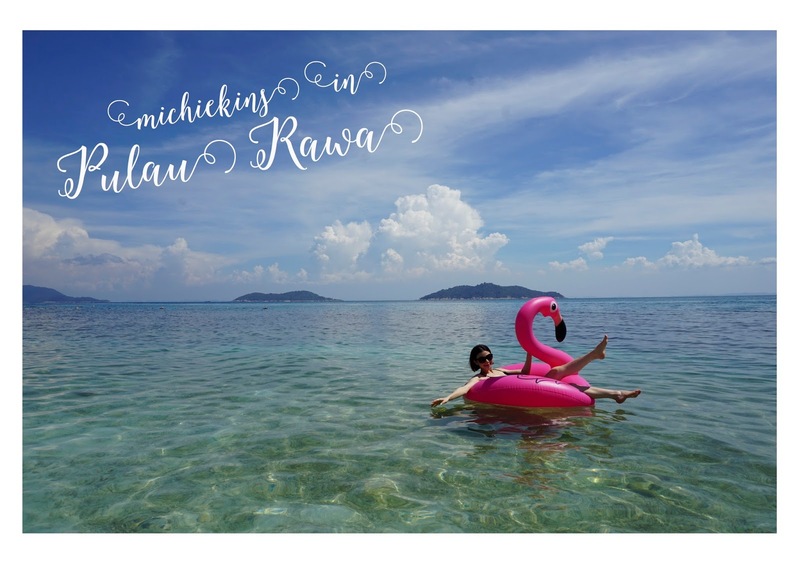 I took part in this challenge with Cik Epal! Vote for me as I am representing Chatime Sweet Potato Cendol-Latea with the hashtag #TiadangiluSPCL on any social media or you can vote at their website too! PLEASE PLEASE PLEASE VOTE FOR ME YEAH! Eveyone who voted gets 20% off the wining drink as you can download the voucher from their website on 1st April2015. Limited to first 2000 vouchers. Copy or damaged vouchers are considered invalid. Vouchers are redeemable at all Chatime Malaysia outlest except Chatime Queensbay Mall, Langkawi, & KL Sentral. The company has the right to change or amend the terms and conditions of the above without prior notice. So, dont waste your time! Check if you have sensitive teeth here and ENJOY our MALAYSIAN FOOD as much as you want! Do not sacrifice something so delicious because there is a solution for this! The answer is Sensodyne! *This is a sponsored post. All samples are provided by GSK and opinions expressed are of my own personal views. cheap nike free trainer I can not think too much. , http://www.nikeplus.com.au Want to eat Tangchaolizai. Still entangled, cheap cheap nike free trainer smell the scent not far floated chestnuts. Okay. Well. cheap nike free running shoes I heard cheap questioning, hastened replied. cheap to buy a cheap nike free trainer pound of chestnuts, and then peel the chestnuts side cheap nike free trainer to side with talking joke.